The most important feature of this agreement is that the seller gives no warranties. Risk for the assets bought is taken entirely by the purchaser. It can be used for the sale of any type or combination of types of assets including machinery and equipment, stock, and work in progress. The only type of asset which it cannot transfer is real property (land and buildings), for which the involvement of a solicitor is required by law. A hive-down, where assets are disposed to a company, possibly a shell, in order for the shares in that company to be subsequently sold. It may be more tax efficient for the ultimate buyer to purchase the assets within a company structure rather than as assets by themselves, yet he or she may not want the obligations or the history of the original business. 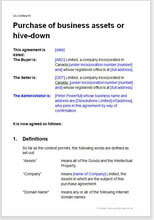 A hive-up, where assets are bought by a parent business in order for the subsidiary to be sold separately or liquidated. A sale by a liquidator or administrator or trustee in bankruptcy. The owner of an unincorporated business wishes to sell assets so that he or she can move to another area, close the business or change the strategic direction of the business. The owner of insurance re-claimed or fire-damaged goods wishes to sell them as seen. A person is declared insolvent and the receiver is selling the assets as per order of the court. The counter party – the acquirer – may be any person, business or other organisation. This agreement is written in plain English, and is drawn for maximum flexibility and ease of use. If you are only selling heavy physical assets then use this agreement for the purchase of used plant or physical assets. It provides for transportation and delivery. If the assets are intellectual property, an IP sale agreement may be more suitable. This document was written by a solicitor for Net Lawman. It complies with current Canadian law. "I needed an Agreement and Google, as always, was where I headed. I found the Net Lawman site and initially I thought I needed a relationship type Agreement but the Lodger one was absolutely perfect. I didn't think it would be so easy so would recommend your website to anybody who was looking for an Agreement to suit their needs." "I needed to start a company fast, I searched and after looking at a few websites I came across netlawman, by far the easiest around. I will be looking again for when I need future documents fast. Thank you." "Net Lawman has helped me through several procedures. The documents in plain English, the drafting service and the delightful customer service means I can get the job done properly, at a price that doesn't affect a small businesses bottom line. Thank you!"